A couple of weeks ago, I won a “Freaky Fruits” giveaway from Melissa’s Produce on Google+. The bounty they sent was so gorgeous that I had to create a sweet, healthy recipe to accompany the vibrant fruit. And thus, this breakfast-worthy, dairy-free vanilla chia pudding recipe was born. I was actually a bit leery of using chia seeds in a recipe like this one, but this blended vanilla chia pudding is surprisingly delicious. Though the texture looked slightly odd to me, it is smooth and perfect to taste. To keep the appearance more on the vanilla side, I used white chia seeds. The more common black chia seeds will provide the same flavor, but the final result may look a little less attractive. Buddha’s Hand – Looking somewhat like a yellow octopus, this monstrous fruit is actually citrus. But unlike lemons or limes, it is all zest and pith. You can literally grate the whole thing, and freeze excess for later use. The flavor reminded me quite a bit of kumquats – much less tangy then lemon, but still notably pungent. I blended some Buddha’s Hand zest into the vanilla chia pudding for a subtle boost, and sprinkled some on top – more for a finishing touch than anything else. Tropical Dragon Fruit – The beautiful pink (or white) flesh tastes every bit as good as it looks and could be my new favorite fruit. The tiny little seeds within are edible, just adding a wee bit of crunch, and the flesh pops out of the shell like a dream. Honestly, if you can locate it, this Freaky Fruit takes my dairy-free vanilla chia pudding recipe to the next level. Papaya – This was the one that I had tried before. On its own, I find papaya to have a little bit of a “skunky” taste, for lack of a better word. But in fruit salad, it melds rather nicely and looses its odd edge (I believe I sampled the Caribbean Red papaya in this recipe). Not to mention, the orange flesh is radiant. Because of its soft texture, papaya (or frozen papaya chunks) also make a good substitute for bananas in smoothies. Cherimoya – The flesh of this green-skinned fruit is actually milky white in color and has both a taste and texture that I would liken to a cross between a pear and a pineapple. Pleasant, but I did find the large seeds to be quite the nuisance and difficult to work around. Cactus Pear – Unlike ordinary pears, the flesh of this fruit is a bright, warm red hue and is dotted with sizable, yet edible crunchy seeds. I found the seeds slightly off-putting, but overall enjoyed the gently sweet flavor and how easily the flesh peeled away from the skin. By ingredients, this recipe is dairy-free / non-dairy, egg-free, gluten-free, grain-free, nut-free, peanut-free, soy-free, optionally vegan / plant-based, vegetarian, optionally paleo, and generally top food allergy-friendly. Simply choose the sweetener that works best for you. 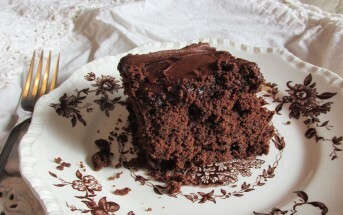 I’m sharing this recipe with Gluten-Free Wednesdays at Gluten Free Easily. I’m also sharing it with Allergy-Free Wednesdays at Whole New Mom and Tessa the Domestic Diva. 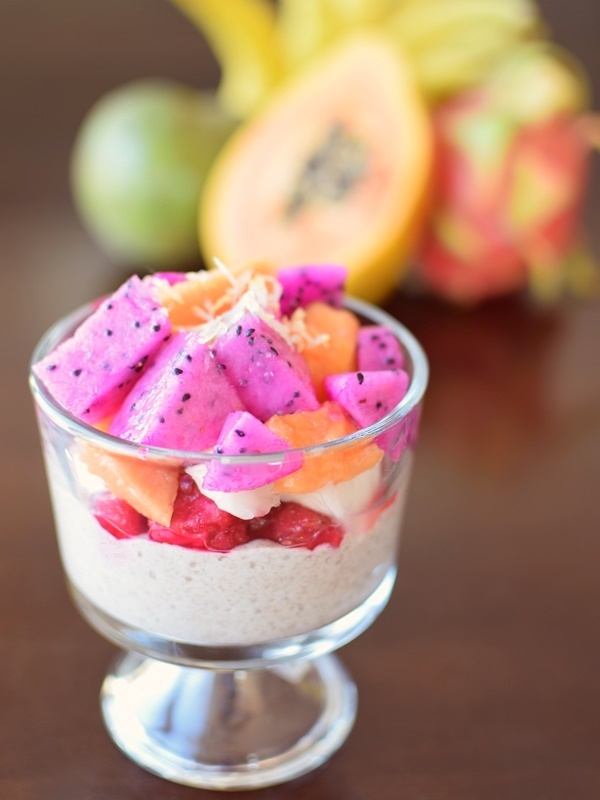 And this vanilla chia pudding with amazing exotic fruit nourishes my body so that I can stay healthy through the holidays! Aside from food, I’m also joining the Holiday Sweat Challenge. This scrumptious vanilla chia pudding can be made thicker or thinner and easily sweetened to taste. Simply see my notes below. 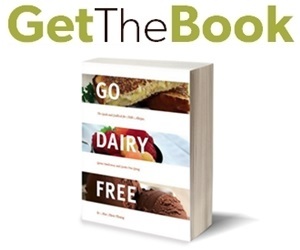 For more great recipes from our kitchen, get Go Dairy Free: The Guide and Cookbook. Place the coconut milk, water, chia seeds, vanilla, zest, and salt in your blender, and whiz until relatively smooth. Blend in sweetener, to taste, and then blend in water, as desired, to thin the consistency. If desired, let the mixture chill for a couple of hours or overnight, it will thicken. *Use more or less chia seeds depending on your desired thickness. If making "instant" vanilla chia pudding, then you may want to use ⅓ cup and add water only as needed, since it won't have significant time to thicken. **Raw honey (paleo), agave (vegan), maple syrup (adds a maple-y flavor), or plain sugar all work great, but to keep the added sugars down, I use 1 tablespoon honey + 20 drops vanilla stevia. I LOVE chia pudding, it’s so good! 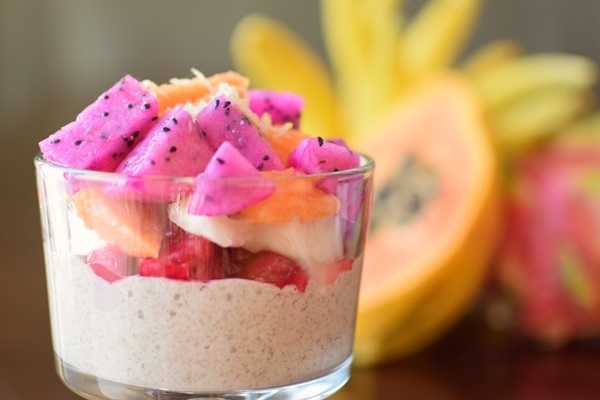 This recipe is very similar to mine, I love vanilla in everything, can’t leave it out of the chia pudding! Yes, many tweaks of chia pudding out there – and it wouldn’t be the same without vanilla – I”m a vanilla freak too! This sounds delicious. I love unique fruit options…going to give this a try. sounds delish! My little lady (20 months) was gobbling up chia pudding for breakfast today, believe it or not! Wow mouth watering. Just wish I could find all the fruits. Looks just fantastic. Vanilla cia pudding very easy and a real quick way for desert. Have to use other fruits but still very intresting. Used watermelon prickly pear kiwi and strawberry. Thanks so much! Yum, that sounds like an amazing fruit combo, too! 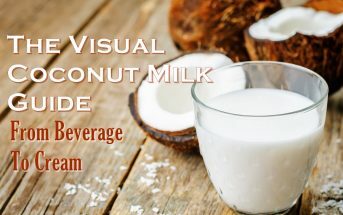 We are allergic to coconut and almond milk. Would rice milk work or can you think of another than would work better? 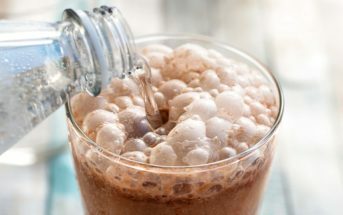 Yes, but I would omit the water and you may want to use the higher amount of chia seeds, depending on your desired thickness. Thanks Ricki – I’ll have to try the dried version! But, I must say, the fresh version of dragon fruit is SO much better than dried! Alisa, it looks absolutely amazing. To be honest, I’m not that familiar with Papaya, but I’m ready to give it a try. Thanks for sharing this amazing recipe. I WANT that basket of freaky fruit!! 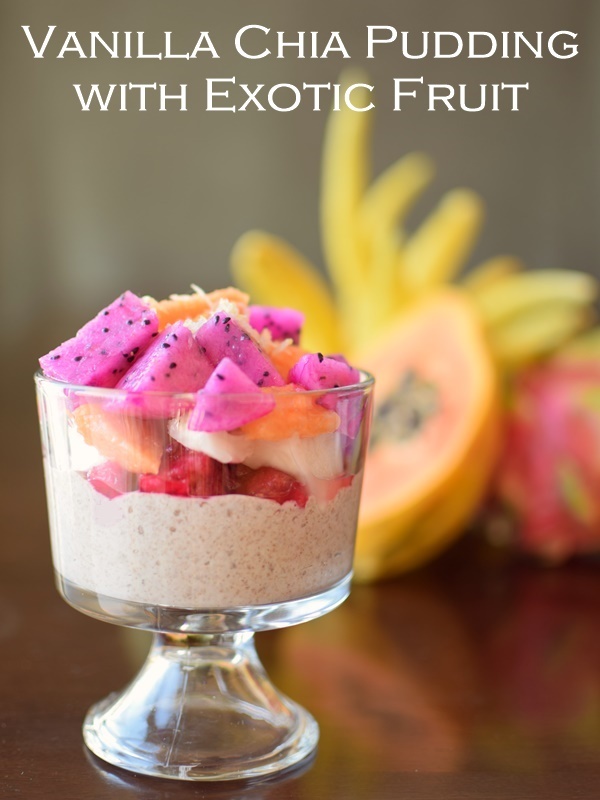 I LOVE dragon fruit – you can get freeze-dried at Trader Joe’s! It taste SO much different when fresh. I wasn’t able to use them cut up, but I am also in love with the rambutans they sent – pricey but so tasty!